Capacity: Approx. 50 bags per min. Main Motor: 1 HP, Three Phase, 50 Hz. 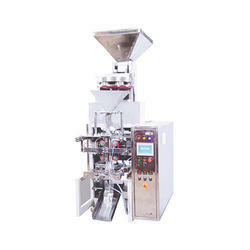 We offer a highly efficient Food Packing Collar Type FFS Machines, which is widely used in food industries. 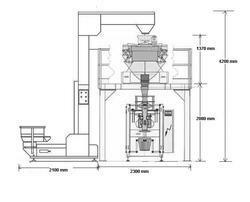 Our engineers design and develop this machine precisely by using high-end machines supported by advanced technology. High grade basic materials are utilized to fabricate this machine with longer functional life. Collar Type FFS Sealing Machine to pack products up to 1Kgs in centre seal pouch. Machine is equipped with MMI & PLC. All product contact parts are made up of food grade stainless steel . Products : Kurkure, Fry Items, Pulses, Rice And Other Free Flowing Items. Packing Material : Heat Sealable Laminated Films. By utilizing skills of our dexterous workforce, we are manufacturing a comprehensive assortment of Collar Type Machine. - Used for packing various kinds of products. Multihead weigher meets the full range of production requirement with 10 to 24 head models. This world's fastest and most accurate multihead weigher achieves unbeatable productivity with reduced giveaway. Also available in Washdown models. To Pack Biscuits, Cream Wagers, Cake, Soap Chocolate Bar, Instant, Noodles, Engineering Components, Jelly etc.